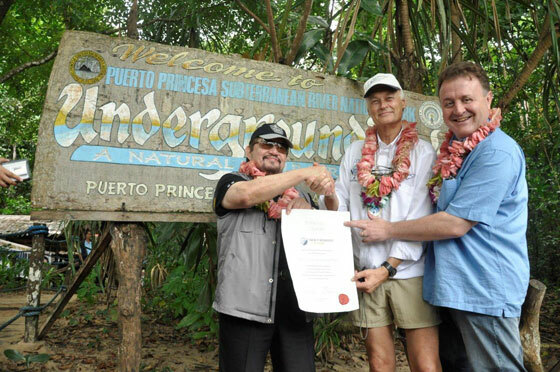 Left to right: Puerto Princesa City Mayor Edward Hagedorn, New7Wonders President Bernard Weber, and New7Wonders Director Jean-Paul de la Fuente, at the handing over in Palawan, the Philippines, of the Official Certificate of Participation for the Puerto Princesa Subterranean River in the New7Wonders of Nature. Argentina, Peru, Poland, the Philippines… the travel itinerary of the New7Wonders team spans the globe, as befits a truly worldwide campaign. The most recent stop was Puerto Princesa City in the western island of Palawan, one of 80 provinces that make up the Philippines. New7Wonders Founder and President Bernard Weber, accompanied by New7Wonders Director Jean-Paul de la Fuente, officially visited the Puerto Princesa Underground River (PPUR) and were given a 45-minute guided tour of the world’s longest navigable underground river by Puerto Princesa City Mayor Edward Hagedorn. Calling the PPUR a “masterpiece of nature”, Bernard Weber urged Filipinos all over the world to vote for their country’s Finalist in the New7Wonders of Nature.